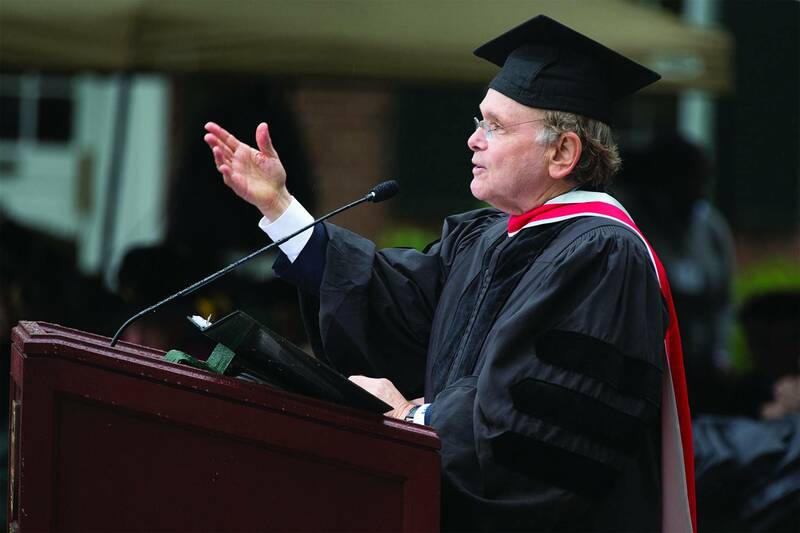 Daniel Yergin, Pulitzer Prize-winning author of "Commanding Heights" delivered the 2016 Investiture keynote address. Confidence. A fitting theme for the main address at the 2016 Tuck Investiture ceremony June 11. But speaker Daniel Yergin, a Pulitzer Prize-winning author and one of the world’s foremost authorities on energy and the global economy, presented a new twist on the subject, highlighting the shift in confidence away from a globalized world—the very world for which Tuck's rigorous education has prepared the class of 2016. Here, Yergin digressed to remind his audience of Dartmouth’s long tradition of entrepreneurs, including George Bissell D’1845, who was responsible for one of the greatest startups of all time, the world oil industry. Yergin, who holds a bachelor of arts from Yale University and a PhD from Cambridge University, is also a business leader, as vice chair of IHS, one of the world’s largest research and information companies, and founder of Cambridge Energy Research Associates, which became part of IHS in 2004. Additional speakers at this year’s Investiture ceremony included Dean Matthew J. Slaughter and Christopher J. Williams T’84, chair of Tuck’s board of overseers, who presented the overseers medal to Tuck Assistant Dean and Director of the MBA Program Sally Jaeger. Robert Thelen T’16 addressed attendees as class speaker. Under rainy skies, Tuck Assistant Dean and Director of the MBA Program Sally Jaeger was honored with the 2016 Overseers' Medal. So why the current hostility toward a global market that has yielded benefits in terms of economic growth and jobs, the flow of information and ideas, raised incomes and better lives, and more revenue for governments? Yergin outlined multiple reasons, starting with the financial collapse of 2008, which resulted in a dramatic loss of confidence in markets, and in the decision-makers. Yergin also cited a much greater focus on the complex issue of inequality, and a heightened sense of vulnerability to international trade and globalization. Help rebuild the trust and reset the balance of confidence on which a growing global world depends. Lastly, Yergin attributed the shift in the balance of confidence to memory. He noted that much of his listening audience would have been about three years old when the Berlin wall came down, thus young adults have no direct understanding of what it meant when the mission of governments was to control the commanding heights.